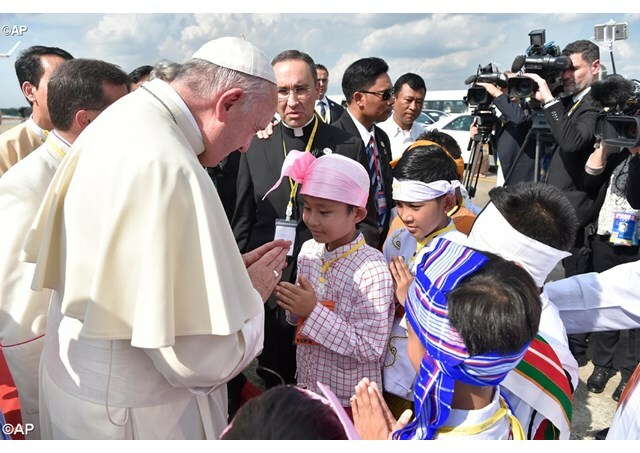 (Combined Text Reports from Vatican Radio) Pope Francis arrived in Yangon on Monday afternoon to crowds of cheering and dancing faithful, as he begins his Apostolic Journey to Myanmar. The Holy Father was greeted at Yangon's airport by the Apostolic Nuncio to Myanmar, Archbishop Paul Tschang In-Nam, and the country's bishops. Also welcoming the Pope was a state delegate representing Myanmar's President Htin Kyaw. Hundreds of faithful robed in traditional dress lined the streets to express their joy for Pope Francis' arrival through dance and song. Pope Francis celebrated Holy Mass in private at the Archbishop of Yangon's residence before having dinner and resting for the remainder of the day. He flies on Tuesday to Myanmar's capital, Nay Pyi Taw, where he will make a courtesy visit to the president and meet with State officials and members of civil society. In-flight greetings Aboard the papal plane bound for Myanmar, Pope Francis briefly greeted the journalists accompanying him on his 21st Apostolic Journey. He thanked them for their accompaniment and work, which, he said, "always bears fruit". The Pope also wished them a safe trip and said, "They say it is too hot now [in Myanmar]. I'm sorry, but may it be fruitful nonetheless." on Monday afternoon, although a first glance around the cities of Yangon and the capital Naypyitaw show few signs of any major preparations. Philippa Hitchen has been travelling around the country, in preparation for this pastoral visit and reports on the expectations of the Catholic community ahead of the pope's arrival. One or two isolated posters and billboards can be spotted around the central St Mary’s cathedral in Yangon and the adjacent archbishop’s house where the pope will be staying for the duration of this three day visit. Further out of the centre, away from the shopping malls and smart hotels, in the townships that make up the sprawling metropolis, the other Catholic parishes have also been preparing for this first ever papal visit to the largely Buddhist nation. Eager pilgrims have been converging on Yangon from other cities too, especially from the northern Kachin state where the majority of Christians are located. I visited Bishop Francis Tang from the diocese of Myitkyina there, watching busloads of men, women and children gathering with their bags on the grass outside his church, in preparation for the two day journey down south. The bishops say up to 200.000 people are expected to attend the main papal events, including pilgrims from neighbouring Thailand, Vietnam, Korea and the Philippines. Officially there has been good cooperation with the Myanmar authorities in the planning of this trip, though everyone is on tenterhooks over the crisis in northern Rakhine state. With western media focused almost exclusively on whether or not the pope will pronounce the word ‘Rohingya’, organisers are seeking to shine the light on the many other refugee problems that still plague this nation, made up of over 130 different ethnic minorities. Several of them are locked in long running conflicts that have seen hundreds of thousands of villagers fleeing their homes and living in squalid camps for internally displaced people. I visited one of the 32 located in Myitkyina alone, where the Church tries to supplement basic services provided to Christian families there by the World Food Programme and a variety of NGOs. Expectations among these Christian communities are sky-high, hoping the pope can miraculously bring the civil war to an end, by encouraging the military and members of the various independence armies to return to the negotiating table. Without peace and respect for all the country’s minorities, they insist, this nation can never develop and improve living standards for the quarter of its population that still lives below the poverty line. That includes people living in the squalid slums I can see from my hotel overlooking Yangon city centre, close to St Mary’s cathedral. Many of them, including plenty of non-Catholics, will be lining the route as the papal motorcade passes by on Monday, or queuing to enter the stadium where he’ll celebrate Mass on Wednesday. For them, this visit marks a once in a lifetime opportunity to welcome the man they’re hailing as a messenger of reconciliation and peace.